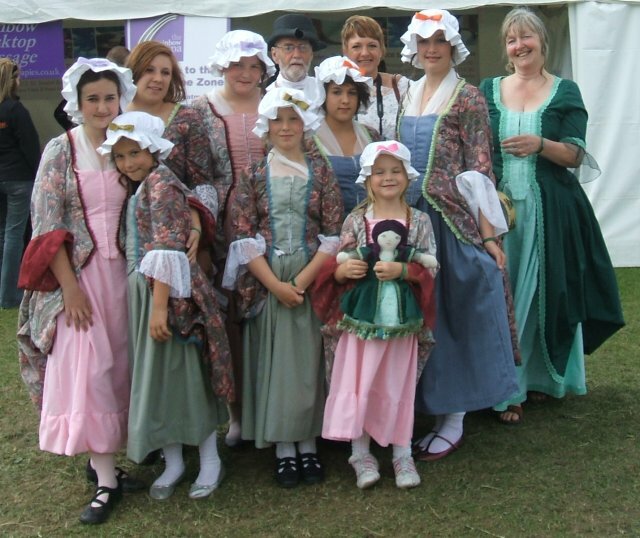 We have English costumes representing three eras: early 18th century, late 19th century and 20th century. These mid 20th century costumes were given to us by the defunct Sussex clogging group 'Les Saboters'. 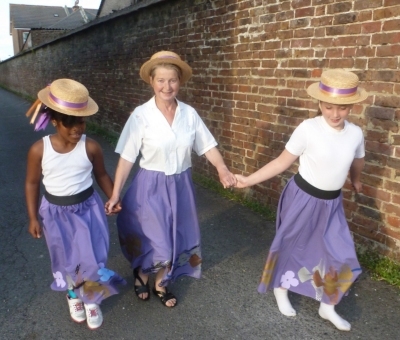 The flared skirts are typical of the 1950s, and straw hats have been traditional for centuries; different colour blouses may be worn. Late 19th century/early 20th century English girls generally wore a pinafore over a mid-calf length dress (or skirt with a blouse or jumper). Our girls' hair is usually held back with blue ribbon tied in a bow. 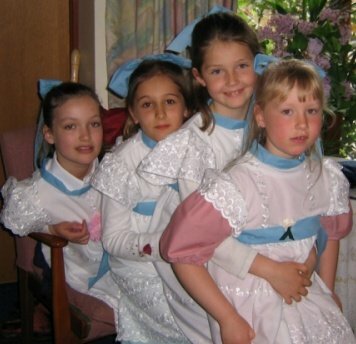 There is also a large bow of the same ribbon fastening the back of the pinafore. The girls sometimes wear short black boots with this outfit. These copies of early 18th century costume have a dress gathered up and worn over the petticoat or underskirt. A fichu is draped over the shoulders under the dress, and there is a mob cap for the head. These costumes are the type usually chosen when dancing English 'Playford' dances .